Service design case with Lapin Kansa newspaper offered a good challenge to develop a new service path in a grocery store. The main idea of the concept was to buy a short or long-term newspaper subscription from a grocery store the same way you buy for example a coffee bag. 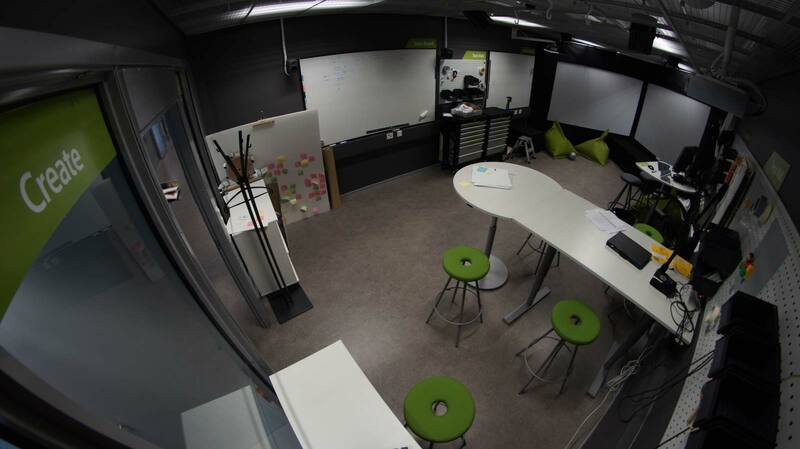 The first step of this project was to collect all ideas and test them in the SINCO service prototyping laboratory. We took pictures from the grocery store and organized them for showing the normal customers’ journey. By changing the view and adding sounds we got a realistic servicescape for simulating the service paths with different target groups. In this case, the target groups were young people and students, at age between 18-35. The student team used a lot rough mock-up crafting while testing the ideas. Adapting the elements in the SINCO laboratory helps you to realize the parts of the services better. Students made for example a shopping cart by turning a bar stool upside down and putting a plastic box between the stool’s legs. Under that they placed a wooden plate with wheels, so it was easier to move. The team utilized also a lot of Fatboy boxes, for example building the newspaper dispensers and a cash desks. The team had three main concepts that they were testing in SINCO lab. The subscription gift, for example for housewarming party, was a nice and useful way for students to know more about local Lapin Kansa newpapers. The newspaper subscription dispenser idea gives you an opportunity to make the subscription by yourself with an easy and simpe user interface. The subscription application idea was developed from the feedback of the target groups. Especially the students wanted to choose the delivery days when the newspaper is cialis ireland coming. The project was challenging and very interesting. The co-operation with Lapin Kansa was successful and it was nice to see that they wanted to participate also in prototyping. The feedback from Lapin Kansa was positive and they were satisfied with the results. Case Lapin Kansa part 2 was continued in Autumn 2011.